There is a growing body of evidence that supports the theory that when people eat well, they stay healthier and are better able to control chronic diseases like diabetes and heart disease or perhaps avoid them altogether. Those who are food insecure are more likely to develop chronic diseases, which means higher health care costs for both insurers and individuals. The problem with healthy eating, particularly for those who are food insecure, is that healthy foods are not easily accessible and/or are not affordable. Even for those who have access to fresh fruits and vegetables, some lack the right tools, skills and knowledge to prepare healthy meals. That's why United Way of Pierce County works with food bank partners, the Tacoma-Pierce County Health Department, Washington State University Extension’s SNAP Ed team and Emergency Food Network for Colorful Cooking Made Easy, a nutrition education program designed to help those who struggle with food insecurity eat healthier. Trained volunteers do cooking demonstrations at food banks with the fresh produce, allowing visitors to try what they have prepared. Food bank visitors are able to watch how easy it is to prepare a healthy meal and possibly try something new. 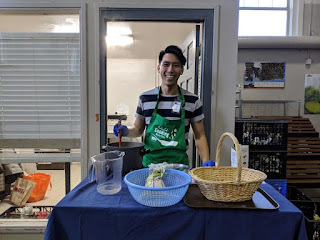 Trained volunteers also teach cooking classes and lead grocery store tours, helping participants with meal planning, shopping on a budget, understanding nutrition and developing cooking skills. Last month, we partnered with a Family and Consumer Science Teacher at Bethel High School and Cooking Matters to host the very first Colorful Cooking 6-week series for students. A trained volunteer leads the class, teaching students cooking skills and nutrition information tailored to fit their interests and needs. Students attending the class will bring home a bag filled with the ingredients for what they prepared in class each week to practice the recipes at home and also promote the healthy eating with family members. We are looking for opportunities to host Colorful Cooking classes at locations where there is a high need for healthy food and nutrition education but with limited resources, with a focus on caregivers to children from birth-5 years old. This is a crucial developmental stage for young children. Promoting healthy eating with caregivers will have a positive impact on their own health along with creating a healthy food environment for the kids in their care. To find out more about Colorful Cooking Made Easy, visit our volunteer opportunity site . Poverty is often described as an individual experience or personal challenge. For example, someone not having enough money to meet basic needs including food, clothing and shelter. It can also be associated with being sick and not being able to see a doctor or pay for medications; not having access to educational opportunities; lack of social support networks; and a quality of life below the living standard for the area. We also know that sometimes a job is not enough. Many American households can’t afford the basics of housing, food, health care, child care, and transportation, despite working hard. Even among those who are employed and often have more than one job, they struggle with monthly expenses that exceed their income. They are fighting an uphill financial battle that, without room to build savings, grows more unsustainable. The experience of poverty and financial instability area also fluid as households move back and forth from financial crisis to stability depending on their income, assets and expenses. That’s the reality facing millions of underemployed residents who are walking a financial tightrope. The best way I’d like to describe the complexity of persistent poverty, low-wage stagnation and financial instability is to identify the all of the core factors that help provide economic stability. 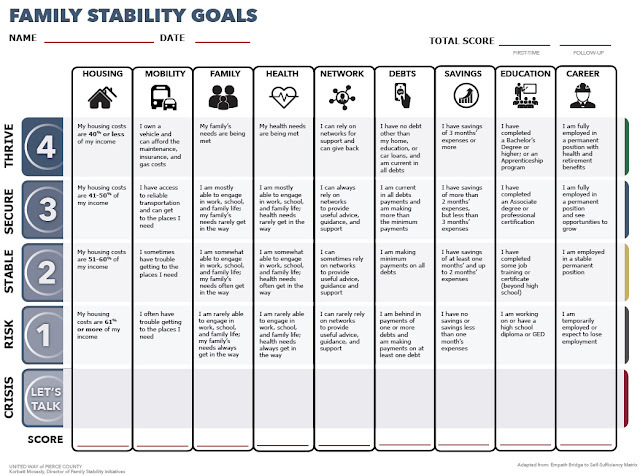 Many organizations have created versions of a “self-sufficiency matrix” that takes a comprehensive, multi-faceted approach to fostering economic mobility. EMPath’s Bridge to Self-Sufficiency® is one notable theory of change that describes a person’s advancement from poverty to economic self-sufficiency as a journey across a bridge supported by five critical pillars—family stability, well-being, education and training, financial management, and employment and career management. For families experiencing financial instability, the range of possible areas to consider working on are broad. I've created a modified version of the bridge to help quickly assess where households are on a scale from crisis to thriving. The assessment includes eight core areas of financial stability: housing, mobility, family, health, social network, debts, savings, education, and career. Often individual goals can be in multiple areas at the same time, so sometimes you need to step back, have a conversation with the client about the big picture for their lives, and then determine what areas to really focus on. Over time people can review their progress where they are now to when they started tracking. This also broadens what success looks like based on the individual’s goals, rather than one set income metric. Poverty and financial instability are complicated. People’s lives are complicated and they are the experts. Moving toward economic stability should be based on individual goals and hopefully they live in a community that can support their efforts. That why United Way is here. That's why our staff and thousands of volunteers take up the call to Live United. It’s tax season and for many, the duty to settle our annual tax obligation generates feelings of dread, fear, irritation as well as other negative feelings. However, for many families, especially those that struggle to make ends meet throughout the year, tax season is often a time of relief. It’s an opportunity for people to address many of the financial burdens weighing on them during the year. That’s because the Earned Income Tax Credit (EITC) and the Child Tax Credit help moderate to low-income families keep more of the money they earn. In some cases, they may even receive a larger return than the amount withheld from their earnings during the year. These credits help hard working families pay for reliable transportation, childcare, groceries and other essentials as well as funding family savings plans for emergencies or future goals. 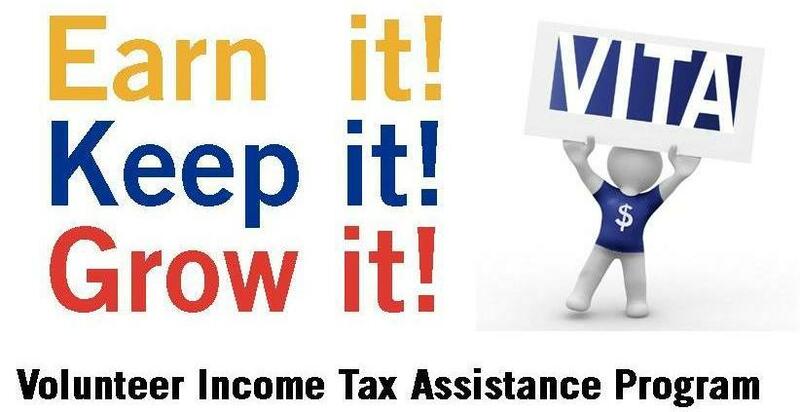 Here in Pierce County and across the country Volunteer Income Tax Assistance (VITA) workers give their time preparing taxes for free to households that meet the income limits or special circumstances including low- and moderate-income households, seniors and people living with disabilities. The VITA program, run by the Internal Revenue Service, provides training for volunteers. In turn, IRS-certified volunteers prepare taxes accurately and ensure that people receive all deductions and qualifying credits, as well as education about financial services and available community resources. VITA tax sites throughout Pierce County are available up to April 15 and can found here or you may dial 2-1-1 to learn more. In Pierce County alone, 5,000+ households annually are served at preparation sites across the county. The result-- millions of dollars go back into our community through tax credits and refunds, which not only helps families directly but also stimulates the economy. Several years ago, I spent a tax season as a VITA volunteer. The training and preparation were thorough and I was fully prepared when the time came to prepare tax returns. During that tax season, I met many people who were working hard every day but still struggled to make ends meet. This population has been formally identified as Asset-Limited, Income-Constrained, Employed (ALICE). ALICE represents the men and women of all ages and races who get up each day to go to work, but who aren’t sure if they’ll be able to put dinner on the table each night. Many shared their stories of challenging financial situations they faced and told me how much of a difference that annual refund made. It really felt good when I was able to show someone the “bottom line” of his or her tax return that revealed a significant tax refund. At those moments, I felt pride knowing that a government program was making an immediate difference for families. South Sound 2-1-1, Associated Ministries, Sound Outreach, Goodwill and AARP Foundation Tax-Aide have partnered with the Pierce County Asset Building Coalition to provide tax preparation services. For households making less than $55,000, they can get free tax assistance and file free at one of 25 sites throughout Pierce County from late January through April. Volunteers will prepare client taxes free of charge, determine if they qualify for EITC and find other credits to boost their bottom line. For households making less than $66,000 a year, they can access MyFreeTaxes.com to file their taxes free. The site provides easy, fast, secure federal and state tax filing online through software partner, H&R Block. I am proud that I am a partner in this work and proud that United Way continues to advocate on behalf of individuals and families in our community. 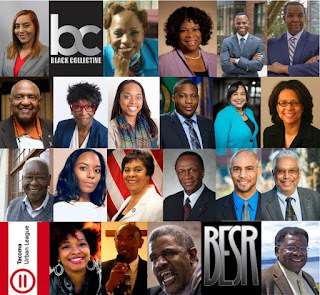 February is Black History Month and while there are a number of incredible past and current leaders across our country, this month we would like to acknowledge the many African American members of our community who are making history in Pierce County. Below you will find just a few of the impressive accomplishments of men, women and organizations that have made their mark and are leading positive change in our community today. This is by no means a complete list, but it includes educators, spiritual leaders, politicians and passionate people lending their voice and power to create positive change. 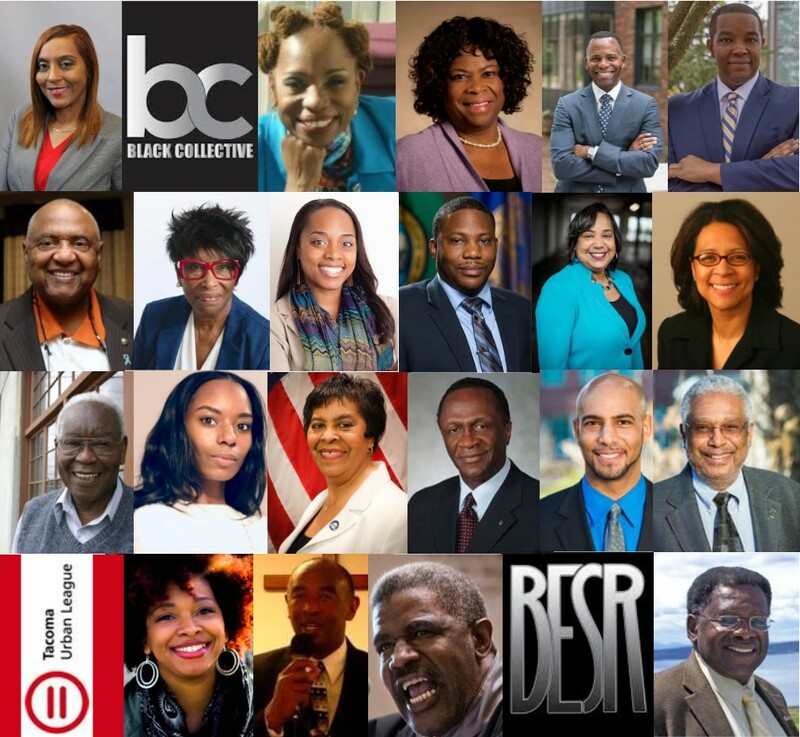 The Black Collective is a community of black people dedicated to civic engagement through volunteer service. Since 1968, they have advanced the political interests of black people, improve the educational outcomes of black students, provides social justice advocacy to black individuals and communities and increased black economic development. Melanie Morgan is a Democratic member of the Washington House of Representatives, representing District 29a. As the only woman of color serving on the Franklin-Pierce School Board, Melanie was instrumental in the passage of the district’s $157 million bond measure in 2016 and two school levy renewals in February 2018. Melannie Denise Cunningham is the Greater Tacoma Peace Prize Laureate a/k/a/ 253 Peace Queen, for her exemplary work promoting racial reconciliation. Dr. Carla Santorno, Superintendent Tacoma Public Schools where she initiates and directs projects that positively affect students’ academic achievement and general well-being. Acting upon the strong belief that every learner can achieve and ultimately succeed. Dr. Isiaah Crawford is president of University of Puget Sound, a recipient of national awards and he has been published on topics including post-traumatic stress, racial inequality, HIV/AIDS, sexual abuse, visual impairment, poverty, depression and more. Dr. Ivan Harrell, President of Tacoma Community College strives every day to lead a group of professionals in providing the best environment, programs and services students need to complete their academic and career goals. Willie Stewart was hired by Tacoma School District in 1960 and assigned to Gault Junior High to teach life science and physical science. Stewart taught at Gault until 1966, when he was promoted to assistant principal. He was later hired at Lincoln High School as assistant principal. In 1970, he became that first black principal in the Tacoma School District.1. Mabel Edmonds is Vice President for Instruction at Clover Park Technical College. she provides leadership for the College's Instruction Department, which includes Baccalaureate Degrees, Professional Technical Degree and Certificate programs in a variety of career fields, Academics, Transitional Studies, eLearning, Library, Northwest Career and Technical High School, and Workforce Development/Continuing Education/Contract Training. Andrea Cobb is Executive Director of the Center for the Improvement of Student Learning, where she acts as the State’s Educational agency’s chief research officer. She leads efforts to connect policymakers, schools, families and communities with research and information about effective educational improvement strategies. Lyle Quasim has held leadership positions in public health and administration in Tacoma, Pierce County and the state of Washington. In 1995, he became the first African American to head Washington's Department of Social and Health Services (DSHS). ). For 7 years he was Chief of Staff for Pierce County Executive, John Ladenburg. Keith Blocker is a Tacoma City Council Member (D3) and he is currently the director of middle school programs for the non-profit Peace Community Center, providing academic coaching, life skills training, and early college preparation to students at Jason Lee Middle School. T’wina Nobles, President and CEO at The Tacoma Urban League, is devoted to empowering African Americans and other disenfranchised groups to enter the economic and social mainstream. For 50 years the Tacoma Urban League has worked in a variety of ways to strengthen and support the local African American community. T’wina is also a board member on the University Place School Board. Mary Moss is Councilwoman (Position 1) on the Lakewood City Council. Lakewood is the second largest city in Pierce County and is host to Joint Base Lewis-McChord (JBLM) and Camp Murray. Victoria Woodards is the current mayor of Tacoma, Washington. She formerly served on the city council for two terms and served as the President of the Tacoma Urban League. Woodards grew up in Tacoma and attended Lincoln High School. Woodards previously served in the United States Army and was stationed at Fort Lewis. Marilyn Strickland left office as Mayor of Tacoma after 8 years, where she was active in the U.S. Conference of Mayors and brought national attention to Tacoma. Today she is president and chief executive of the Seattle Metropolitan Chamber of Commerce. Harold Moss was the first African American to serve as mayor of Tacoma, Washington. He was also the first to serve on the Tacoma City Council and Pierce County Council. He has been active in the Tacoma community since the 1950s when he was a member of the local branch of the NAACP. Jim Walton was the Director of Tacoma’s Human Relations Department in 1970 and in 2003, he became the first black city manager. In 2018, he was awarded the Community Health Care Humanitarian of the Year. He also serves on the board of United Way of Pierce County. Jessie Baines, Jr. is the Commissioner of Metro Parks helps help shape the future of the parks he grew up in, He also helps low-wage workers develop career advancement plans through the Tacoma Urban League. Aaron Pointer was a pro baseball player for more than a decade that included playing for the Houston Colts, which later became the Astros, Chicago Cubs and later the Tacoma Cubs, a farm club. He serves as the President of the Metro Parks Board of Commissioners. Tom Hilyard is Program Development Specialist in Tacoma’s Human Development Department. He served on the Pierce County Health Council, instrumental in writing the Federal Urban Health Initiative grant, which stabilized clinic funding. Tom Dixon started the Tacoma Urban League in 1968. For 50 years the League has worked in a variety of ways to strengthen and support the local African American community and is devoted to empowering African Americans and other disenfranchised groups to enter the economic and social mainstream. Kelly Richardson is Tacoma Poet Laureate and is a writer, artist, and educator whose work explores the intersection of race, class, and gender with specific emphasis on themes of love, loss and longing. Reverend Toney Montgomery is a spiritual leader at Fathers House Church and serves as the chair for the Tacoma Ministerial Alliance. The organization works collaboratively with many other community and faith-based organizations by advocating for freedom of worship and social and economic equality. Reverend Gregory Christopher is the pastor of Shiloh Baptist Church in Tacoma and president of the local chapter of the NAACP. In 2017 went to Washington D.C. ready to face arrest during a demonstration supporting the Affordable Care Act. Capitol police took him and 46 other demonstrators away in handcuffs. He continues to fight for affordable care for all. The Black Education Strategy Roundtable is a volunteer-led coalition that actively advocates for and providing information to policymakers at all levels about the disparate conditions of educational achievement for Black students in the state of Washington, which impacts all facets of life and our communities. Thank you for letting me share this piece. Last week after the amazing Poverty to Possibilities summit, I took some of the leftover muffins to a food bank that was open on the evenings so that their clients could enjoy them. (As a side note, I love it when food banks are open during nontraditional times during the week as we know so many folks are working during the day and can’t hit up a food bank that’s only open 9am – 4pm). As we recently learned in the ALICE report, 42% of our county is struggling to make ends meet or they are in poverty. This is up 10% from two years ago. This is staggering. When many households have to choose to pay rent, utilities or food, they choose to pay rent/utilities and will head to a food bank to get food. Now back to my night after the UWPC event. I headed to a food bank and got there 10 minutes before it opened. I met with the warehouse manager and weighed the food and a high school volunteer immediately started putting the muffins in individual baggies. As I looked up from the scale, I noticed tons and tons of cereal on the top shelves. OODLES of cereal?! My contact was busy working to accommodate me and our last minute donation and help manage expectations from the many volunteers in the food bank. Then I couldn’t help but notice the influx of people into the food bank. Now, this food bank isn’t in an urban area. It’s rural so people have to take the time to get there. My contact was busy helping volunteers look for specific items, such as chicken soup as a mom was looking for some - - either boxed or canned - - for her little girl who was sick. “Sorry, we don’t have any this week,” I heard. Ugh. Then I learned that there is no milk in the state for the food banks. This caused me to pause. The area in the warehouse that had tons of cereal would be distributed to clients but with no milk. This made me think that it’s just like giving crayons to kids and then telling them there was no paper. I learned that Washington State was one of three states that did not receive bids from local milk vendors therefore it’s very likely that there will be no fresh milk for our food banks from last month to March 2019. While there are plans to work with the dairy industry to get local bids, this is a gap with our food partners that many people do not know about. · Help fundraise with “Dollars for Dairy” for your local food bank - here is an example of what you can do. · Ask your legislators what they can do and ask for a timeline. · Make a monetary donation designated for milk to your local food bank. 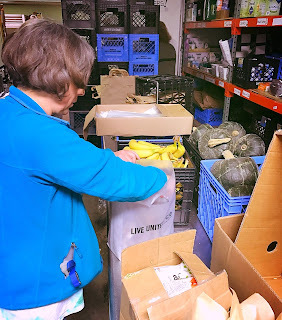 · Volunteer time at a food bank. · Work with United Way’s Hunger-Free Pierce County initiative to stay abreast of the work. Dr. Michael McAfee challenged us to be dogged about our work. YES! He also said we are here because our institutions have lost their capacity to serve. He was spot on. I got up at 4am to write this as I know those folks in the food bank are my people. They need to be of all our people as Dr. McAfee said. As I left the food bank, I noticed so many kids outside happily playing in the dark while their parents or caregivers received food. And then I got in my truck and slowly started to drive away from the small food bank. It reminded me of the end of the movie Field of Dreams. There were so many cars in the parking lot and more cars pulling up with their lights on. As the camera pans up and out, the cars continue for miles. While the cars didn’t continue for miles in my case, it was lengthy and one where I hope anyone would be truly uncomfortable. But more importantly, I want people to act and advocate. I will. One in six children struggles with hunger and many children who rely on school meals, struggle to get enough to eat during the summer months. This fact is unacceptable to United Way of Pierce County as well as many local health and human service partners that are fighting hunger. Together, they are helping to provide kids with nutritious food at various sites during the summer months (from June 25-August 30). More than 100 children, families and volunteers turned out for the kickoff event held at the Drake Apartment complex in Tacoma, sponsored by CenturyLink. 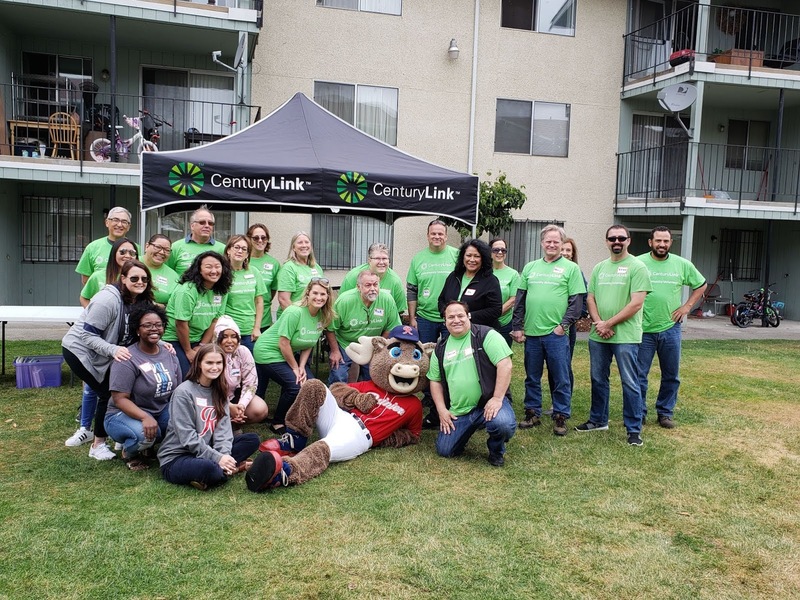 It brought employees from across CenturyLink departments together to learn more and by rolling up their sleeves to dig into the work—with activities focused on activities with books and serving food. “We are glad we had the opportunity to help United Way celebrate the worldwide Day of Action, and we had a great time helping the children at the Drake Apartments with summer learning activities! We are thrilled with this partnership because it brings home the work that needs to be done to support children and families in Pierce County.” --Robert Betancourt, Manager, Regional Operations, CenturyLink. In addition to offering free, nutritious meals, several of the sites provide an incentive for children to participate in summer enrichment programs, which means that children are not only well fed, but engaged in academic and recreational activities. Raising awareness and advocating for important food assistance programs like SNAP are part of the hunger puzzle. Earlier this year, United Way along with many partners worked with legislators to ensure that Breakfast After the Bell (House Bill 1508) passed to help address student hunger and increase family financial stability by making breakfast part of the school day – just like lunch. Summer Meals is a federally funded program providing free lunches and sometimes breakfast and snack, for any child 18 and younger who lives within a qualified school area or neighborhood area. To qualify, schools must have 50% or more students signed up for the free and reduced price lunch program. The majority of sites receive federal reimbursement for qualified sites. There are challenges with serving schools and neighborhoods where there are hungry children, but not enough to meet the 50% USDA threshold. Some nonprofit organizations are using the private pay model to ensure children are fed, while others partners host serving sites where there are hungry kids, but the sites do not qualify under USDA guidelines. These sites receive funding through private donations and grants. Summer Meals partners are: Bethel School District, Boys & Girls Clubs, Clover Park School District, Families Unlimited Network, Food Backpacks 4 Kids, Franklin Pierce School District, Metro Parks, Orting Food Bank, Pierce County Library System, Prairie Ridge Community Center, St. Leo Food Connection, Sumner School District and YMCA of Pierce & Kitsap Counties. To learn more, visit www.piercecountysummermeals.org to find sites, locations, dates and times or you may call South Sound 2-1-1 by simply dialing 2-1-1 for more information. United Way fights for the education, health and financial stability of every person in Pierce County. Our bold goal is to lift 15,000 families out of poverty by 2028. Please join us in our fight.